Universal Data Manager (UDM) is a GUI based solution for managing an organization’s z/OS Storage at an Enterprise level, including, Tape Robots and Tape Catalogs, DFSMShsm, CA-Disk, ICF Catalogs, DASD Volumes, DFSMS objects, Spool data and other related objects. The overall ease of installation and automated analysis provides the controls, information and reporting needed to manage the dynamics of modern Storage environments. Automate the management of z/OS objects by dynamically reacting to Console messages or conditions, or users can schedule timed processes to interrogate the status of an object. Monitor the status of z/OS objects via the centralized monitor, which allows a user to view and react to alerts from all z/OS Systems via a single GUI window. Report on all aspects of enterprise z/OS Storage subsystems centrally, in real time or historically, using SQL filters. Using a single request, for example, a user can view in a central window the status of Storage groups on all of their z/OS Systems. Maintain z/OS Systems using the Command or JCL interfaces which allow users to centrally define, store and run Z/OS commands or JCL decks. Simplified installation, minimal customization and pre-configured processes mean users can install and gain the benefits from the product in minutes rather than days. Management of z/OS storage is becoming more of a challenge due to the ever-increasing size of Data Storage farms and the decrease in the manpower to TeraByte ratio to manage this Storage. 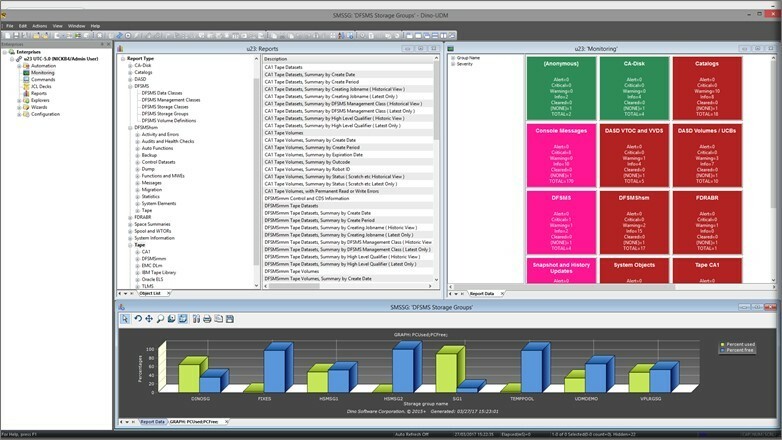 The net result is critical management processes such as Audits of the Catalog environment or monitoring of DFSMShsm environments are being ignored, while other tasks such as the initializing of volumes are performed without the time to ensure the required checks have been actioned, thereby increasing the possibility of user errors. UDM solves these issues by simplifying and automating most of the tasks involved in managing data. Collect information on objects and retain Historical information allowing proactive analysis of data to determine any actions required. Simplify the processes needed to report on an object via a series of boxed reports. Trap critical Console messages and send an alert when critical conditions such as DASD errors occur. React to object conditions such as Catalog or VTOC errors or Scratch Tape shortages. Provide notification of exception conditions as they occur via the central Monitor window that receives alerts from all controlled Systems. Simplify the day to day processes such as initializing volumes by ensuring volumes are offline to all systems, including systems outside the sysplex. Additionally, UDM provides the ability to define and test Service Level Agreements on a single system and then, via a single mouse click, provides the ability to Propagate the processes to manage these service levels to all controlled Systems. Who is UDM designed for? UDM fits seamlessly into any Data Center due to its flexible architecture. Customers with existing third party products can easily tailor UDM to interface with these existing products. Large multi-site customers can use UDM to define a standard set of Service Level Agreements and then propagate these to existing customer Systems, via a single mouse click, or implement these standard Service Level Agreements as new customer Systems come on board. Big data Centers benefit from the ability to work with multiple systems at the same time; for example, defining a new ICF Alias for a new User can be performed on all Sysplexes in a single request. Smaller data centers with less manpower resources benefit from the supplied and pre-configured processes, meaning fewer resources are needed to maintain and monitor storage, thereby freeing up personnel for other tasks. Storage managers can use the powerful monitoring facilities to be alerted when critical Storage conditions occur such as full Catalogs or Storage groups. They can then utilize delivered Commands or JCL to react to these conditions or customize the product with their own, site specific, actions. Capacity planners using the SQL based reporting processes can automate the collection of capacity related data such as Usage by High-level qualifier or Tape usage growth and easily review and manipulate this data. Operations support can easily analyze problems such as volumes accidently being offline to systems and react using customized Commands or JCL decks. Systems programmers can easily analyze System messages, Spool or the general Storage architecture and issue z/OS maintenance commands via the Commands Interface. When should UDM be used? 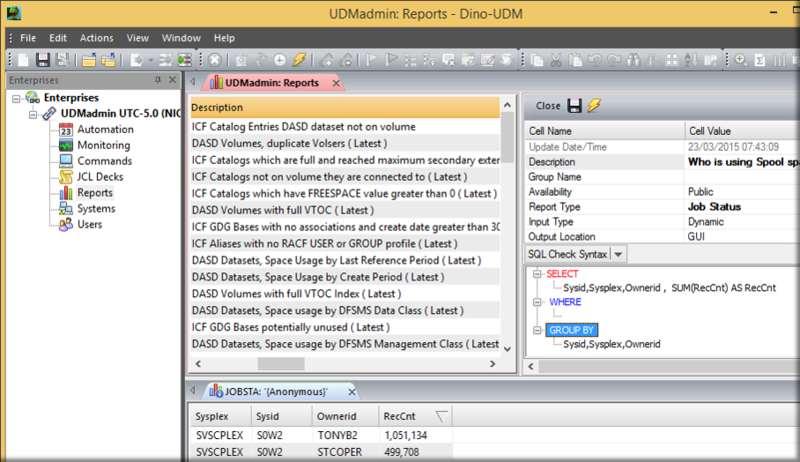 UDM can be used to proactively monitor Systems, or it can be used to perform adhoc tasks on request. By activating UDM on a System, simply by starting the Started task, UDM will be automatically monitoring and maintaining Systems, as well as collecting historical information on Systems for further analysis. 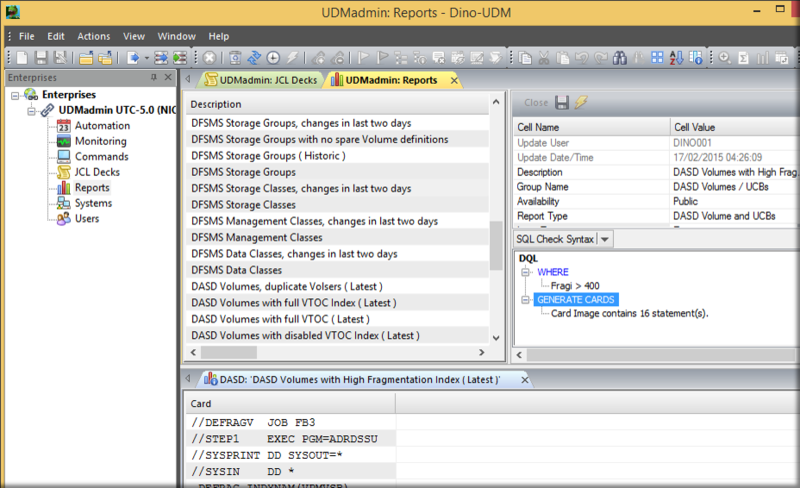 Identify volumes with a high Fragmentation Index and then build and submit DFDSS DEFRAG control cards. 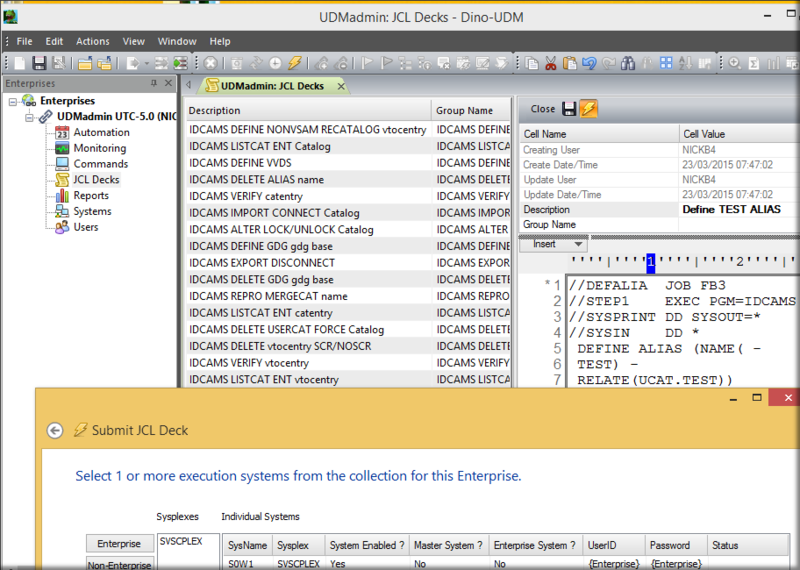 Generate and submit IDCAMS DEFINE ALIAS control cards on all Sysplexes to define a new Userid. List all datasets associated to specific mask across all Systems and Sysplexes and generate control cards to delete them. Identify DFSMShsm volumes which have failed Recycle or Creation across all DFSMShsm systems. Identify who is filling up the spool by running the Spool report, grouping by Ownerid, and Summarizing by Record count. 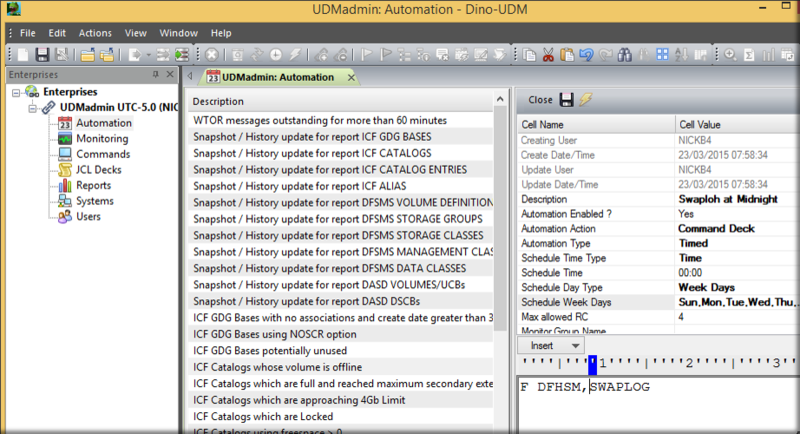 Trap message IGD008I (DFSMS configuration activated), locate the active SCDS and ACS routines, and create a date timed backup of the datasets. Identify non-duplexed VTV Volumes with an Oracle VTSS subsystem. Automatically issue a DFHSM SWAPLOG command on all systems at midnight.